If you and several friends or your family is considering group travel to Ireland, do it. Whether you're just going to hang out and relax in the bustling city of Dublin, or take a road trip to explore the stunning Irish countryside, your trip will be even more special with a group of friends. Did you know that groups of travelers are typically given freebies and discounts if traveling in Ireland together on a single reservation? More importantly, if you have several people in your group, many hotels and airlines will give you an additional discount just for being the organizer. Planning group travel to Ireland isn't easy. You'll need to balance the needs of the group to get from one place to another, but also allow individuals time to roam at their leisure. If you work with an expert, you can take advantage of those travel discounts while also ensuring a good balance between group and individual time. This tour of Ireland has something for everyone. Beautiful scenery greets visitors in County Wicklow, Kerry, Connemara and Donegal, each offers something different from mountains views and glens to lovely lakes and wild coastlines. Literature enthusiasts will get to see the countryside that inspired the poetry of William Butler Yeats and the lively city of Dublin which inspired so many of Ireland's literary giants. Shoppers will enjoy visiting the town known for fine crystal Waterford, and the opportunity to visit woolen mills. Everyone will be fascinated by the varied history explored from Viking invasions, to Cobh, emigration point during the Famine and the Medieval monasteries and castles dotted throughout the country. View the complete day to day Explore Ireland Itinerary. Experience the diverse and mysterious landscape of Northern Ireland and the west coast of the Republic. Ireland is a land steeped in a brew of rugged beauty, ancient traditions and modern culture. Your adventure begins in Belfast, once the largest city in Ireland due to its industrial boom in the late 19th century. Walk through the volcanic rock formations of the nearby Giants Causeway. Sample genuine Irish whiskey. Travel north to Derry to see the ancient city walls and hear the tale of tragic "Bloody Sunday." Continue to Donegal where you will stay overnight in a 15th century castle. Head south down the coastline to Galway, stopping in Yeats country and Knock, a historic place of religious pilgrimage. From the City of Tribes, you will venture into Connemara, where chances are you will hear some Irish spoken by the locals. 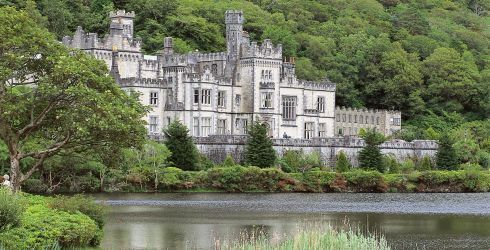 Stop in at Kylemore Abbey, home of a Community of Benedictine nuns since 1920. Shop for Irish hand knits and other regional specialties in a quaint market town. View the complete day to day Ireland: Belfast, Derry, Donegal and Galway Itinerary. Explore Ireland, where the green hills roll on as far as the eye can see until they plunge into the oceans that meet the stunning coastline. View the complete day to day A Week in Ireland Itinerary.